Staff was assigned the project of finding two students that inspires them to come to school. Here are some of the staff members’ choices. Special thanks to David Kahle for producer and Justin Leitch cameraman for this video! Click on the picture above to view video. Click the icon below to browse Alleghany High School memorabilia. Awesome things are happening here at AHS! Alleghany High School Spring Extravaganza is April 16, 2019! You are cordially invited to our Spring Extravaganza showcasing various students’ projects and achievements on April 16, 2019, from 4:00pm to 7:00pm at AHS. Numerous activities will be going on during this time, and your presence would mean a lot to us. Please join us to view the wonderful things our students have been doing with the help and support of our parents and the greater community. It has been stated time and time again, “The children are our future,” and the future is now! This is an excellent opportunity to celebrate the future. Alleghany High School Staff and Student Expo is April 18, 2019! AHS will host its first ever Expo/Spirit Day on Thursday, April 18th. An Expo is a large-scale event organized to educate, innovate, promote, and foster learning within a variety of disciplines. As you will see from the link below, AHS will spend the morning involved in many different learning (and fun) experiences. Students and teachers are to review the agenda/schedule and plan their morning, accordingly. The link to the agenda/schedule, and posters about the Expo Day have been put up around the school, too. Students are encouraged to get to their sessions quickly, as they may fill up, which means you will want to plan a second and third choice for both sessions, just in case. ALL students are to report to a session during the 1st session and the 2nd sessions. Students will NOT be reporting to JRTC at all during this day but staying at AHS all day. Teachers will be posted in the hallways in between sessions to ensure that students are not out of bounds. If anyone has questions, please see Ms. Huff, Mr. Ross, Ms. Almarode, Mrs. Hampton, Mr. Dobbs, and/or Mrs. Staunton. ​1st place - Jayme Bradshaw for her story "Kitty the Candy Queen"
​2nd place - Ruth Linsin for her story "Mask"
​3rd place - Maggie Thompson for her story "The Good Dog"
​Please join us in congratulating them! September to December of 2018, a group of faculty at Alleghany High School, Team Gibson & Calvert, worked hard to raise money for two of our own faculty members, Ms. Stacey Gibson and Mrs. Teresa Calvert. Team Gibson & Calvert worked tirelessly throughout the first part of school year to put on events and raise money for their battle against Breast Cancer. Sadly, Ms. Gibson passed away on October 4, 2018. Ms. Gibson’s family wants to do a Scholarship Fund in honor of Ms. Gibson. On December 14, 2018, the students and faculty on the team were elated to present Ms. Gibson’s family and Mrs. Calvert each with a check of $2,425. The Alleghany Choir and Alleghany Cheerleaders coordinated a beautiful presentation for the families before the check presentation. Ms. Gibson’s family is using her check for a senior scholarship at both Alleghany and Covington High Schools. Mrs. Calvert is using her check for expenses. Team Gibson & Calvert would like to thank everyone in this community that helped with the fundraisers endeavors. Cindy Solak, Teresa Reed, Georgia Gray, and Crystal Hamilton with Team Gibson & Calvert wanted these students at Alleghany High School to be recognized for all their hard work. Picture from left to right: Mrs. Teresa Calvert, Gabe Meadows, Alex Newman, Jordan Davis, Mary Emma Shifflet, Sydney Burks, and Honoring Ms. Gibson (Brother in law) Frank and (Sister) April Reynes. On Thursday 11/29/2018 at the end of the school day, members from the Alleghany High School Law Enforcement Club conducted a “candy checkpoint” in conjunction with the National Highway and Traffic Safety Administration’s (NHTSA) seat belt campaign of Click It or Ticket. The participating members were Shawn Carter, Joseph Edwards, Ira Loan, Sidney Robinson, Zach Sexton, Johnathan Scruggs, Cody Taylor, and Chris Tucker. Deputy Clinton Phillips of the Alleghany County Sheriff’s Office is the sponsor and training coordinator of the Law Enforcement club at AHS. The mission of the candy checkpoint was to bring awareness to drivers and passengers about wearing their seat belts. Deputy Phillips would safely bring those vehicles to a stop at a three-way intersection exiting the school. This would then allow the members to approach the vehicles in a safe manner. Club members would approach the vehicles and offer Smarties candy to drivers and passengers wearing their seat belts and offer Dum-Dum suckers to those not buckled up. They would also offer a reminder for those not buckled up that it is a law to buckle up. The checkpoint was also monitored and tracked for seat belt usage. One member acted as a recorder and monitored the first 100 vehicles that entered the checkpoint and kept a count of vehicles for the duration. Of the first 100 vehicles, 70 drivers were buckled prior to entering the checkpoint area. The vehicles included students, teachers, and guardians picking up students. Jerri the Chicken was raised by Alleghany High School students as part of a Project Based Learning (PBL) experience. Jerri has turned into a local celebrity with her visit to The Brian Center. She visited with many of the residents there, who spent a lot of time holding Jerri and relaxing with this unexpected visitor. The Alleghany High School Administration would like to thank and congratulate the students, staff, parents, guardians, grandparents, aunts, uncles, brothers, sisters, cousins, and community members on a wonderful Alleghany High School Fall Extravaganza. This was first event of this kind at AHS, and it was great learning opportunity for everyone to see what our students and staff have been doing, as well as make connections for the future growth of the school and community. The goal of Alleghany County Public Schools is for its students, staff, and community to be the guide for the world to follow. In order to be the guide, they must first explore, design, create, map, and build along the way. “We will continue to work and learn by refining our successes and correcting our mistakes as we use project and problem based learning to benefit everyone. We hope to improve our learning outcomes, community involvement, and be better each day in the future. Your feedback is vital to this end,” said Ross. The TEACH students finished their successful internship at the Clifton Forge Library, and our students were given a celebration by the director and his staff. Invited guests were, Mr. Kotulka, Dr. Heath, Mary Jane Mutispaugh, Ms. Huff, and Ms. Birchfield. The students displayed their capabilities in categorizing, organizing, and shelving books, and they shared this knowledge by performing the tasks for their guests. The photos below are the students performing their task and enjoying the “fruits of their labors”. 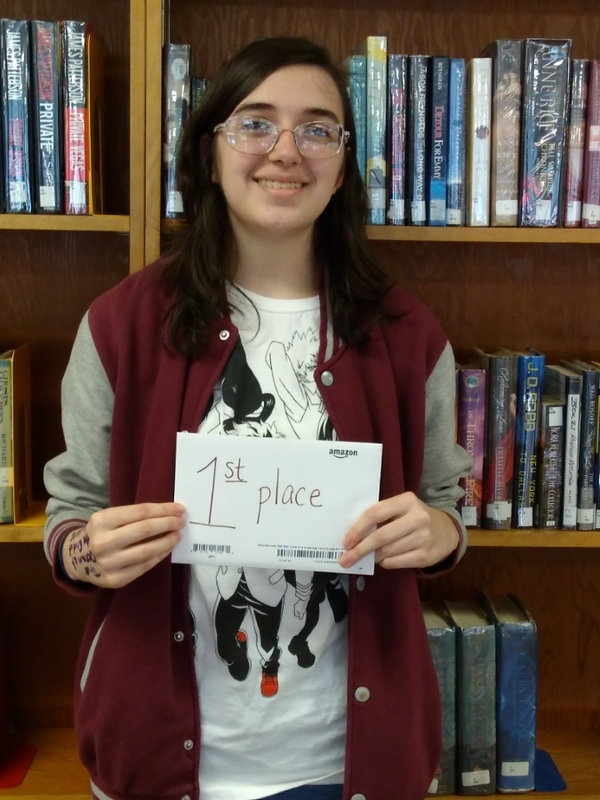 Congratulations to all of the students who have participated in the Alleghany High School library writing contests for the months of September and October. In September, students competed by writing science fiction short stories, and the winners were announced the second week of October. Alexis Haymaker won first place, Jayme Bradshaw won second place, and Madi Brown won third place. In October, AHS celebrated Anti-Bullying month with a “Dear Bully” letter-writing contest. The winners of that contest were announced at the end of the month. Paula Putnam won first place, David Donnan won second place, and Sam Wood won third place. Also in October, students competed in a second library writing contest by writing horror short stories. In first place is Jayme Bradshaw with her story, "We Don't Talk about Bailey." In second place is David Donnan with his story, "The Devil's Maze." In third place is Lydia Armontrout with her untitled story. Please join us in congratulating these students! Special thanks and congratulation to Tina Linsin for holding these various contest. October 3, 2018, Alleghany High School members of the Family, Career and Community Leaders of America (FCCLA) attended FCCLA Day at the State Fair of Virginia in Doswell, Virginia. Over 25 members, advisers, and chaperones enjoyed a day filled with educational and leadership opportunities. Members also participated in an SOL Scavenger Hunt where they explored Virginia’s largest outdoor classroom, matching educational opportunities throughout the fairgrounds with related Standards of Learning, including those encompassing family and career issues. FCCLA is The Ultimate Leadership Experience for students enrolled in Family and Consumer Sciences across the nation. It is the only national in-school organization with the family as its central focus. Participation in state and national programs and chapter activities helps members become strong leaders in their families, careers, and communities. Do you want to wish your classmate a happy birthday or need to know when an event is taking place at AHS? Click the student announcements tab that has been updated for 2018-2019 school year to find out who may have a birthday today, for weekly events, student information, and helpful links. Please see the AHS Tobacco Letter link here to parents pertaining to Alleghany High School's updated policy on tobacco use on school property. Alleghany High School is excited to be a part of the Alleghany County Public Schools’ 1:1 Chromebook initiative. We are happy to prepare our students for success in the 21st century. Parents must have registered a PowerSchool account before you can sign into your parent Echo account! It also take 24 hours after registering your PowerSchool account for your Echo account to become active! New Tech Network, a national nonprofit organization, is a leading design partner for comprehensive K-12 school change. We coach teachers and school leaders to inspire and engage all students through authentic and challenging work. The New Tech model combines pervasive project-based learning, an engaging school-wide culture and the real-world use of technology tools and resources. We support the whole school through three key structures: professional development events, coaching, and Echo, the NTN project-based platform. New Tech Network students consistently outperform national high school graduation and college persistence rates. The network consists of more than 200 schools in 27 states and Australia.